Small Details Make All the Difference! If you can turn the steering wheel, switch On/Off the lights, or activate the windshield wipers in your rain scenes, then your animations are going to look much more realistic! This model has been conceived not just to look great from the outside but also from the inside, allowing you to use the interior of the vehicle as another set for your animations. Use emissive materials and activate the GI (Global Illumination) in iClone 7, to see the computer screens, panels, and gauges emit light - creating the perfect atmosphere for your night sequences. 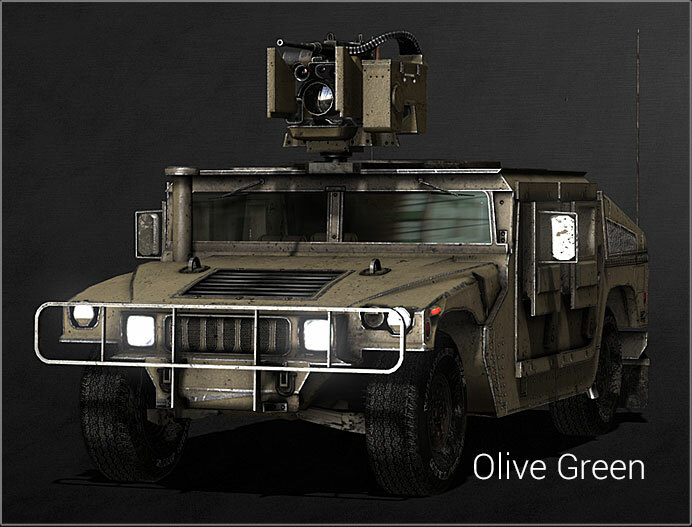 The Humvees are attached to a 4Wheels - Physics Toolbox controller that allows you to actually drive the vehicle on iClone terrains while recording generated motion. The controls allow you to speed forward and backward, and turn the wheel direction changing the trajectory and speed of the vehicle. The spinning wheels will automatically be synchronized to the translation movement, enormously facilitating the realization of sequences when the vehicle is moving. The Physics Toolbox runtime is included in this pack, so no additional purchase is required. To know more of Physics Toolbox. 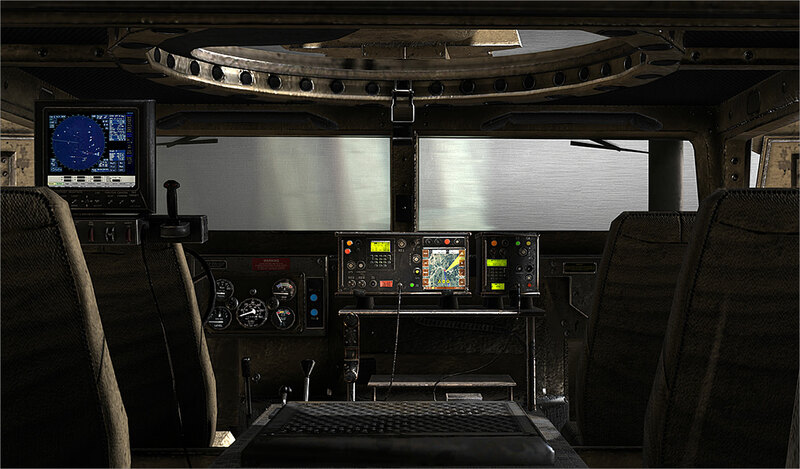 This system allows you to operate the machine gun from the inside of the vehicle by using a computerized aiming system situated behind the driver. 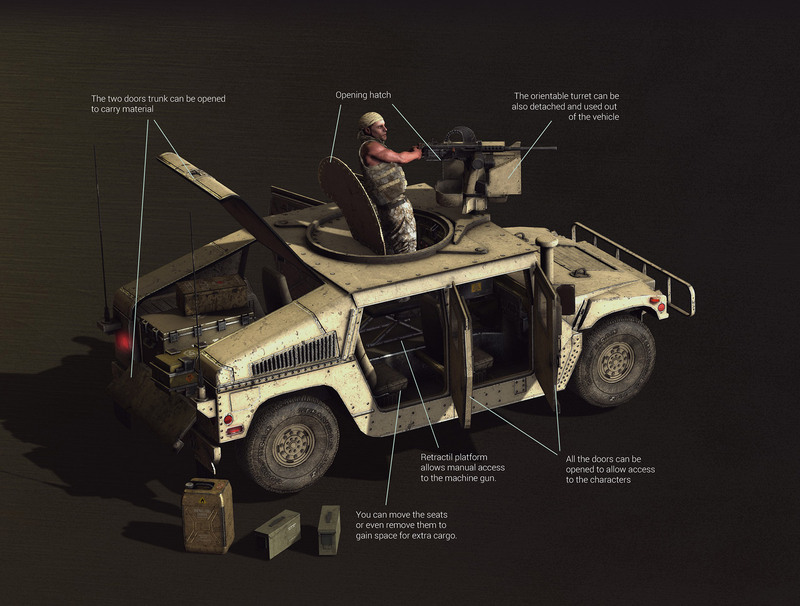 The machine gun can also be operated manually through the hatch in the roof of the vehicle, using an extensible platform that lifts the gunner to better reach the weapon that is also included with the model. Offered in three different colors and two versions; one static to use without physics, and another with Physics Toolbox Controllers that allow you to actually be driving in real-time over iClone terrains while recording the generated animations. 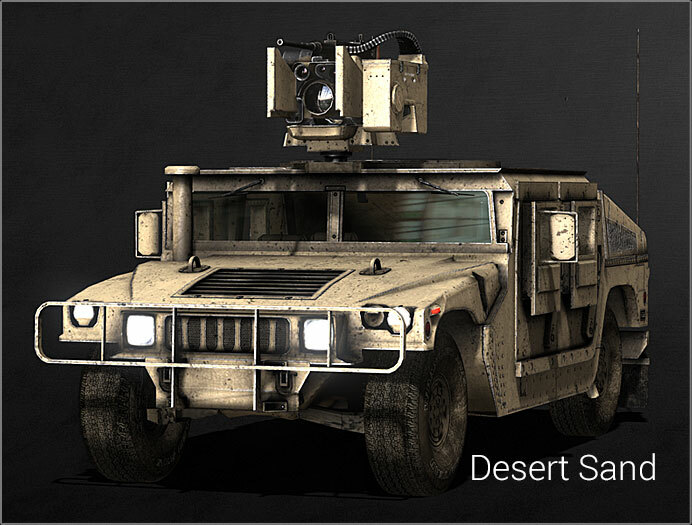 You can also detach the machine gun module to transform the Humvee into a commander’s vehicle. This pack delivers three extremely detailed vehicle models of an armoured HMMWV (High Mobility Multipurpose Wheeled Vehicle) commonly known as “Humvee”. The Physics Toolbox incorporates the Bullet Engine physics system. iClone 7 users will need to switch from the default PhysX Engine to the Bullet Engine in the Project Settings panel for proper results. EXPORT: to export content, please remember to acquire the Export Version if you wish to export assets to game engines, or other 3rd party render engines.